I’m having a dress made. 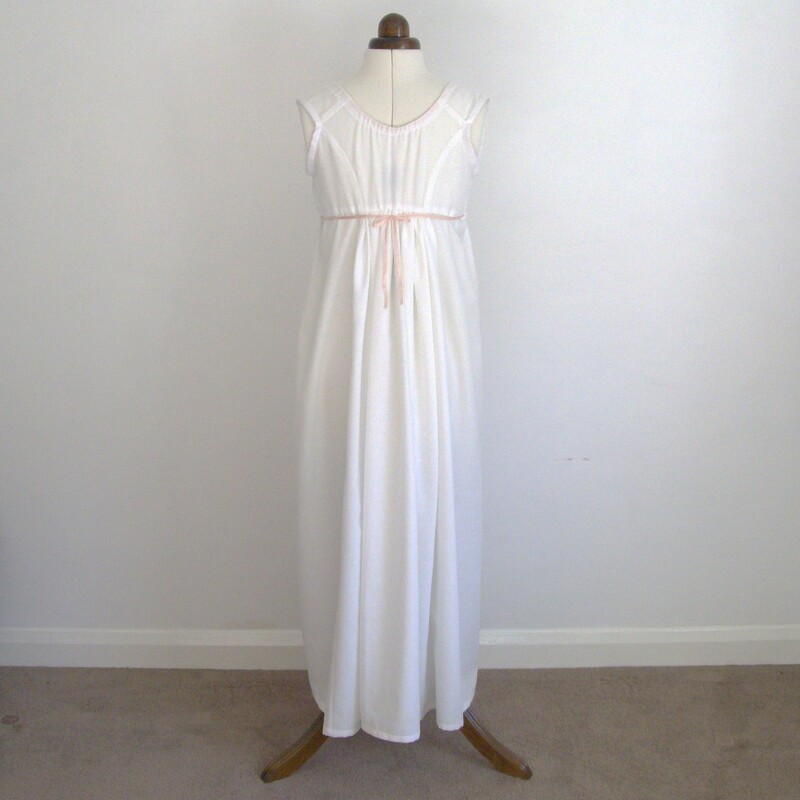 Not just any dress, I am having a gown that would be correct for the 1810s, which is when Shades of Milk and Honey is set, so that at the launch party in August I can be appropriately attired. To that end, I took myself to my modiste’s on Tuesday to discuss our plans for my ensemble. 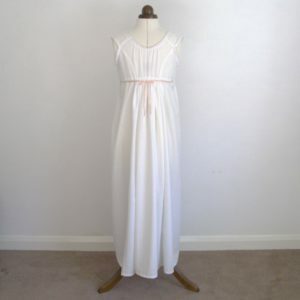 After looking at several options, we have settled upon a simple cream sprigged muslin gown with a spencer jacket. The gown will be flexible enough that it can be worn with several different looks should the need arise. 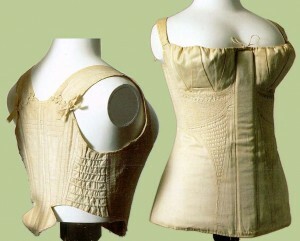 Meanwhile, I have ordered the undergarments necessary to create the line that is desirable under the gown. While one would not normally discuss such things in mixed company, I feel that it is of sufficient interest that I shall eschew the normal proprieties. To begin, there will be a chemise which is worn next to the skin. Mine will be like this, but sleeveless. 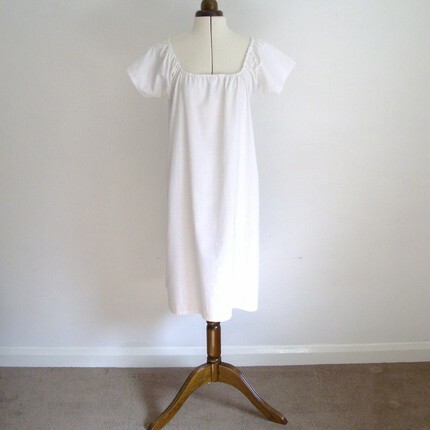 I have selected a white lawn fabric and the seamstress will embroider my initials upon one corner. I feel so very indulgent. After the chemise comes the short stays. Now we did consider going with the modern equivalent, which is a demi-cup underwire bra with very short straps, but one of the reasons I want to do this is that in Glamour in Glass there are several scenes in which a ladies maid is helping her mistress dress and undress. While I can, in fact, read about this and have a perfectly fine understanding for writing the scenes I know from past experience that actually experiencing something will point out details that I wouldn’t have considered on my own. Which means that I’m having short stays made. The short stays is considered a transitional garment in that it is midway between a corset and a bra. The one on the left is a short stay from the Kyoto Institute’s collection. 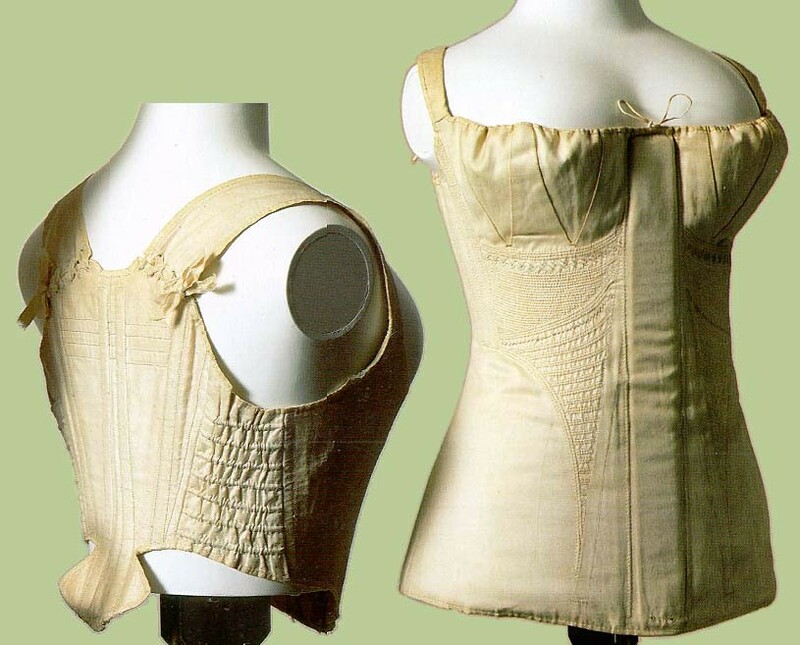 One of the things about the Regency look is that the bosom is pushed up very high as you can see in the corset on the right. It makes all the difference in the line of the dress. After the short stays comes a bodiced petticoat. Now I’m showing you the back of this garment because the construction of the bodice is interesting. What we know of as “princess seams” did not exist in the Regency. You can see how the seams on the bodice are straighter and run higher on the back than a princess seam would. To give the freedom of movement that a modern dress has, the armseye comes around much farther to the back. Will this particular detail show to anyone but me? No. I could have gone with a different garment that would serve the same function but I find the changes, not just in fashion but in sewing technology, to be utterly fascinating. You will, I’m afraid, have to wait to see pictures of the dress in progress. We are meeting again on Tuesday to look at fabrics. The chemise and petticoat are coming from here. Can’t wait to see the dress – they’ve done a beautiful job of the undergarments! Hugely impressed. As for the invisible details… oh, you totally know they’re there even if nobody else can see. Always worth the extra effort! Are you going to go with 1810 hair as well? Sounds like you have a lot of fun plans for the launch party. I can’t wait to see the dress! It hope it will be fun. Regency dress, deserts and beverages are in the plans. Oh, what fun! You will find it interesting to wear garments constructed in a period style. I have found that there are always reasons for things – like the armseye being in back – that seem strange until you put them on and discover why it’s built that way. The chemise link and short stays link both point to the same place. That looks like a lot of cloth and the release is going to be in August in the South. True, however given the level of air conditioning I’ll bet I still need a shawl to be comfortable. I would love to have an excuse to wear a regency gown! I would probably just stitch one up from a Butterick pattern or something. There are quite a lot of rennaissance and regency patterns in the catalogs now, that did not exist back in the 80’s and 90’s when I was learning to sew. However, those patterns would certainly be modern in design and not involve complicated undergarments. The difference in garment construction is fascinating. Now, for me, I am very short between the bust and shoulder, so I have to wear straps pulled all the way up in my everyday clothing. I would definitely need a custom undergarment to get the look you describe. How have you found a seamstress who knows how to make this kind of dress? Is she fannish, or SCA? I share your attraction to the costuming, but I don’t know any other *writers* who wear costumes at the conventions, so I’d feel terribly self-conscious. I know writers who wear costumes to parties at conventions but not to panels. This is what I’m planning on doing with this dress. It’s a party dress, not a work dress. The launch party is both work and party but otherwise, when I’m in writer mode, I’m not likely to wear it. At least, that’s my theory. We’ll see what happens when I actually own it. It seems to me that Kitty in Heyer’s Cotiilion wound up with a short, curly haircut.